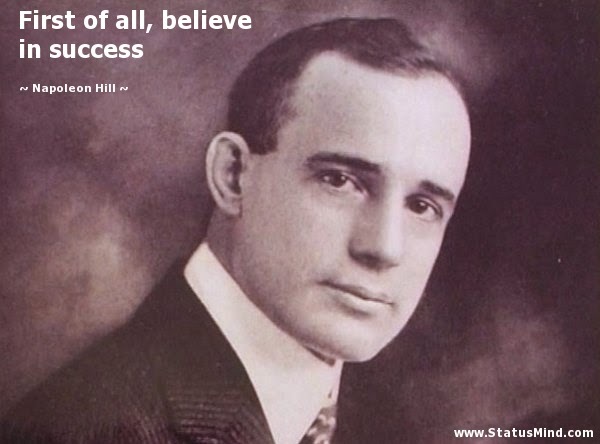 Napoleon Hill is the man, I have been invariably craving and yearning for. His biography has inspired and goosed me to be what I really am. His philosophy has civilized me especially in the department of ultimate power that every individual of us has. I feel fortunate to have come across his books and deeds which are really inspiring and stimulating. The more I read his books, the better I realize about the possibilities in the world impossibilities. The better I discover his deeds, the best I am able to dig the depth of my life and mine gold and silver from it. Thank you dear beloved Napoleon Hill for encouraging me to be an eager beaver. Being Hill's fan, I could not stop myself from sharing his seventeen principles of success which are absolutely high-yielding and awfully soul-inspiring. I am very much sure that it will yield greatness in every one of us, if we diligently, sincerely live up to these principles. I believe they are the nuts and bolts of our ultimate success; Happiness and everything. To implement above principles in our life would seem just a dreamlike dream but if we allow our mind to make it a great-like dream, I always believe that we can certainly do it. And we can surely climb the rocky obstacles with hardy soul. We just need to stand boldly in our own thoughts and weave a habit of accepting above principles little by little with much patience, energy and enthusiasm. Gradually and finally, everyone of us can reap success and leap ourselves. Best wishes from me as you try yourself to busy with these principles.